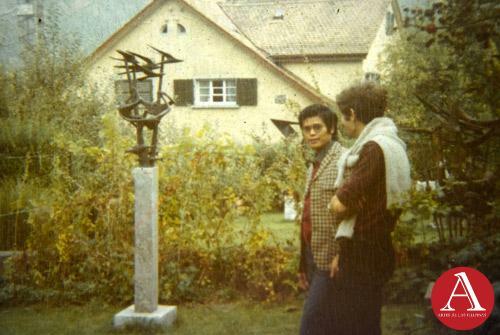 Lamberto Hechanova took up residence in the East Coast in the 1960s. Tell us about the development of his artistic career in this period. Bert arrived in the USA in the year 1969 and settled in Baltimore. He visited various art museums in the area and immersed himself in the art culture of this new environment. His first few years in Baltimore were spent exploring, experimenting and further developing his own art. To reminisce the old memories during this period, I had a chance to visit Baltimore in Spring 2015 to meet and talk to his long time artist friends and acquaintances. They also showed me around to have a look at their collection of his works and paintings. All of them have the respect, admiration and kind words to say during the time they were with my father during the 1970s. It was evident that he was very productive in his art career development during that period and was determined to create his own mark. Did he arrive in the US with your Mom and your sibling? 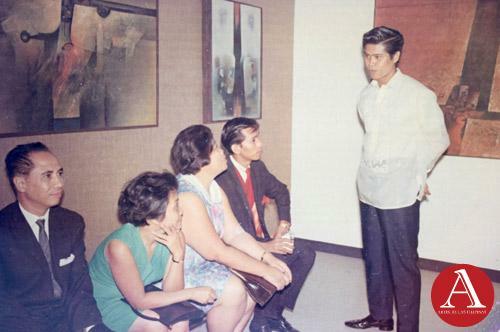 Together with his peers, Bert traveled to the US in 1969 while his family remained in the Philippines. 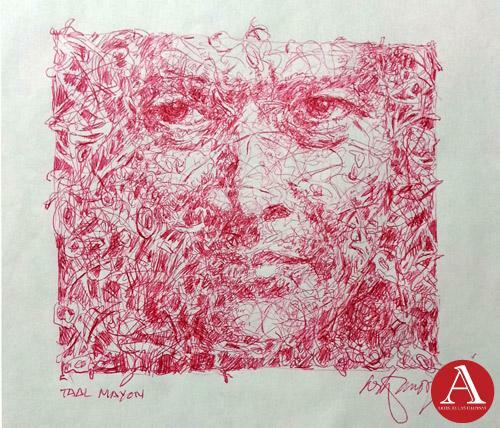 He received this travel grant from the Art Association of the Philippines after representing the country in the sculpture category at the Paris Biennale Expo. My father and I got re-connected in 1996 when I first met him in New York. I was working in Singapore at that time and the company I worked with sent me to New York and Los Angeles for training and conference. Looking back, all I can say, is that it is probably God’s plan for us to meet each other. First Award of Merit, ARITISTS USA National Art Competition, World Trade Center, New York. Did your father seek employment for a regular job or did he continue making art? 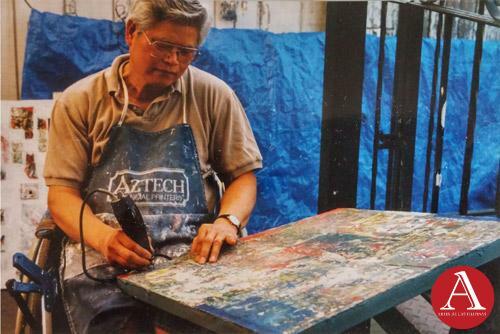 He continued to make art while living in Baltimore and he collectively held art exhibits and group shows in other states like the Philippine Embassy in Washington, Indiana, Toronto, etc.. He was not interested in a full-time regular job as Bert’s primary goal and #1 priority was always his art. In doing so, he decided to only have a part-time freelance job in various ad agencies to support himself and to devote the rest of his time to art exploration. AWARD WINNER NOTICE: I've never been so thrilled and thankful because the top award, Governor's Prize, was unreal, it was unbelievable but true. I got the top award which every artist in Maryland crave and aspire for. Quite a record in Maryland Annual Art & Science especially for an artist like me. It is not the money really, but the satisfaction and fulfillment of one's aspiration, a materialization of triumph, a great honor for my friends, my people and my country, and to all the artists." 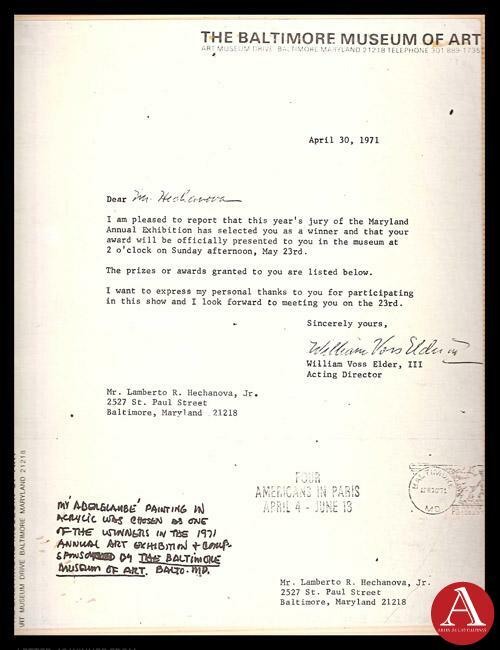 Up to now, I still have the letter and envelope from Baltimore Museum, which was given to me by my father for safe keeping. What were the states did he live and work in? Bert lived and settled in two states: Baltimore and New York although he travelled across other states like Washington, Indiana, New Jersey, etc. for his art and group shows. 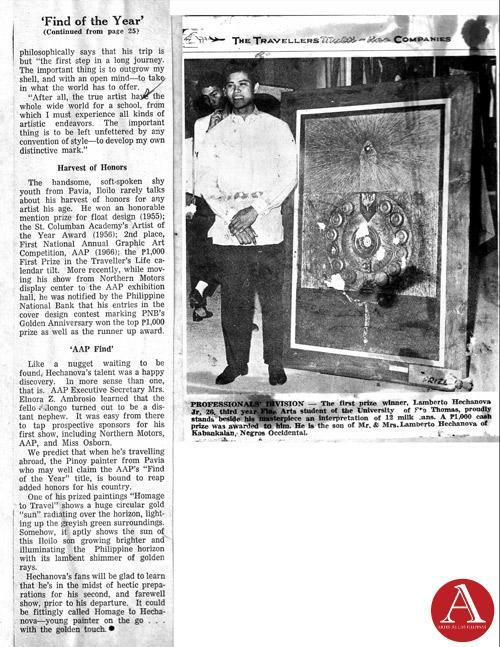 Was your father a member of an art organization in Baltimore or did he connect with fellow Filipino artists in the East Coast? Not sure what local art group he joined at that time and if such an organization still exists now. 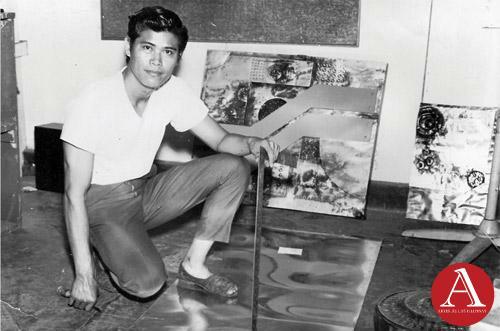 What I am sure was that he was active and well known in his time among Fil-Am artists while he was in living Baltimore. I will find out more once I visit Baltimore again. Hechanova first started as a painter in the 1950s and then branched out to printmaking before doing sculptures. 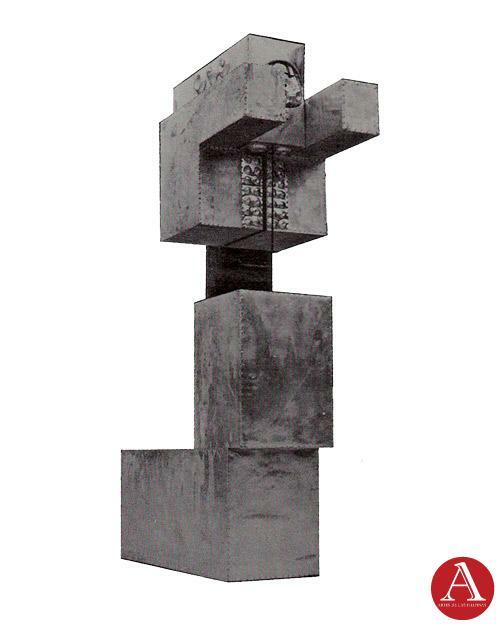 What made him shift to sculptures? Although Bert started winning in painting and printmaking in the mid-1960s, his distinct style of dimensional assemblage artworks were also sculptural by nature. 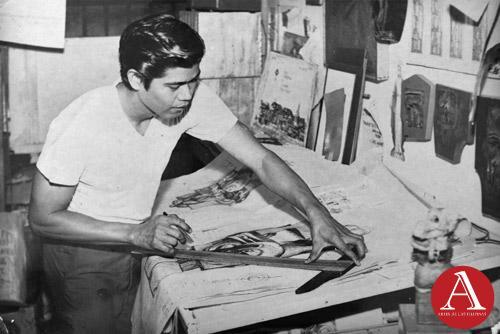 He was learning printmaking at that time in the Philippine Women’s University and due to his success, he was offered to teach in the Fine Arts Department and received a research grant in Sculpture. To be able to win in the Sculpture category was a great challenge and so he took it on. 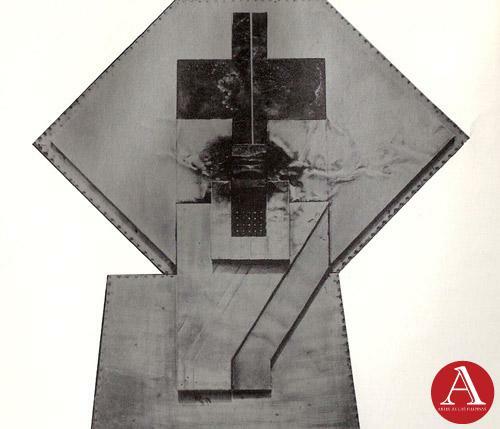 His studio at PWU was where he made a lot of experimental and notable award-winning sculptures as well as his Philippine entry in Sculpture (Transformation I, II and III) at the 1969 Paris Biennale. 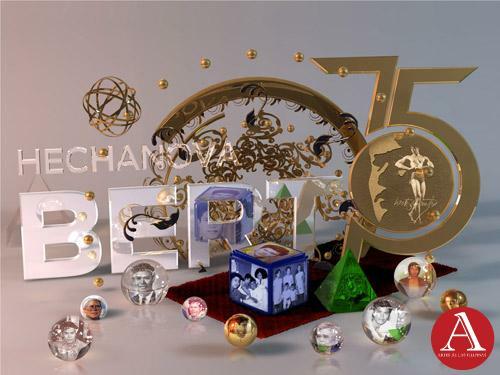 Lamberto Hechanova’s award-winning works always have this presence of “progressive, unconventional and innovative trademarks.” His mindset was that art was universal and knows no boundaries and it was his preference not to be confined to a certain style, rules or category. 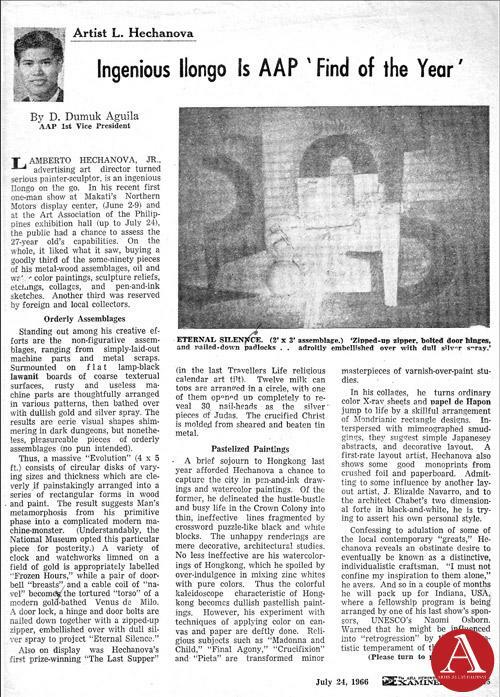 If one were to examine a few of his award-winning works in the Philippines like “The Last Supper” (1966 First Prize - Professional Division sponsored by Traveler’s Life) and “Venetian Flight” (1st Prize - Artists USA NY World Trade Center 1981), they were “crossover style,” a hybrid mix of painting and sculpture that was unconventional and unique during his time. Why do you think your father named this series Transformation? I have only seen a sample photo of this in the Paris Biennale 1966 catalogue which I still have with me. There are also some photos of it when his studio was featured on a magazine as a background setting for a trendy fashion photo shoot. 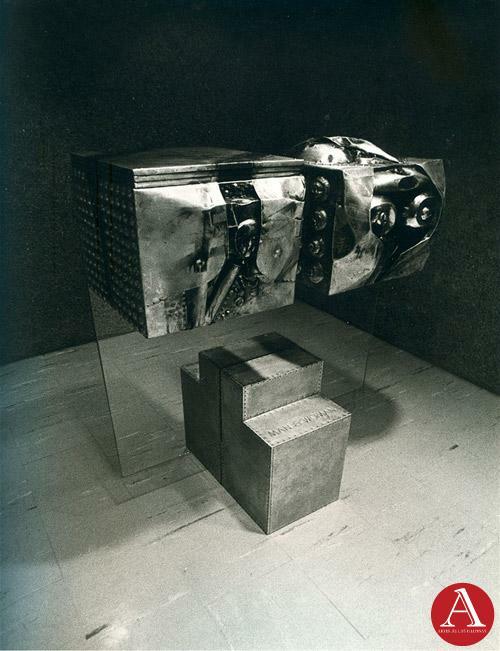 Most likely, the title Transformation was the best word to describe this sculpture as it was physically made in modular sub-parts that can be assembled conveniently when it arrived in Paris. It may also have an emotional connection to him as an artist as it signified his bold step to his formative years in seeing the world for the first time. 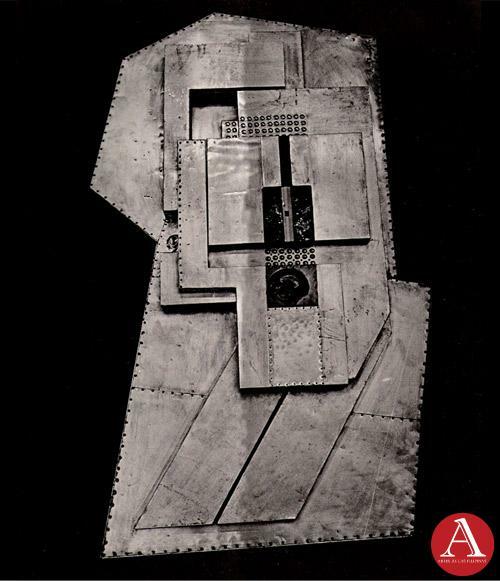 Why do you think your father become distinct in using aluminum as the material for his sculptures? 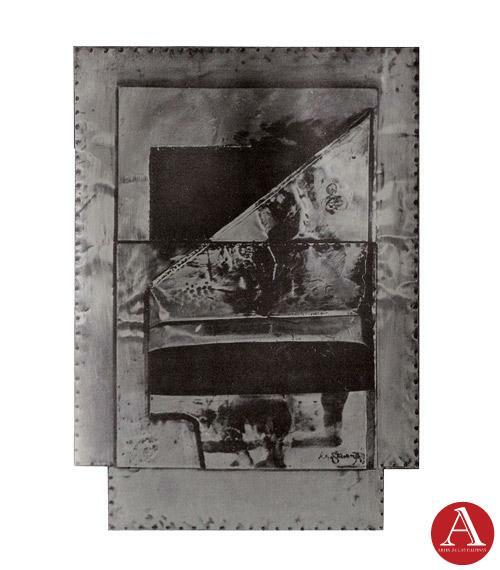 In the mid-1960s while other artists used wood as a material for their sculptures, Bert showcased massive works of art primarily aluminum, glass and wood on his sculptures and assemblages. His entry pieces in sculpture competitions were done using these combination of materials, as well as most artworks for his one-man show art exhibitions. What prompted him to use the idiom of abstract for his paintings? This question was always asked to my father many times and he had a chance to further explain this to me. I have personally seen a lot of my father’s works in many different styles-- be it realistic renderings, watercolor, gouache, pen and ink illustrations, architectural drafting, portraits, mixed media, pencil graphite sketches and several others. They were just outstanding that it tells me how multifaceted his talents were. But personally for Bert as an artist, the abstract style is the one that offered unlimited freedom of expression in art. To him, it was a synthesis of freeform and subjective to many interpretations from the viewer. 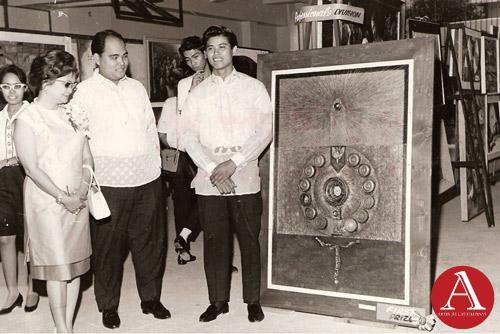 Your father was a regular fixture and winner at the Art Association of the Philippines Annual Art Competition in the mid-1960s. What do you think was the most important award that your father received in his career? In fact, the twelve milk tin cans were actually from what I consumed at that time as a newborn that my father collected and used for his artwork. 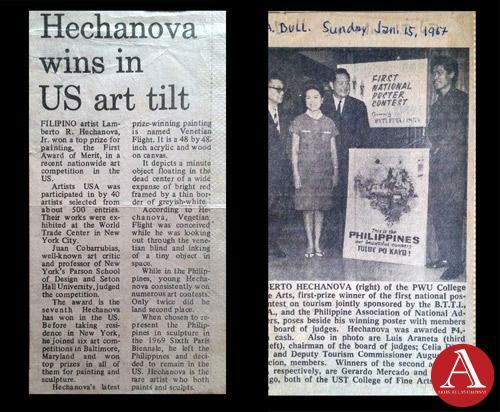 From there onwards, the artist, Lamberto Hechanova had arrived and was discovered by the Philippine Art. The consecutive winnings in 1971-1972 in Baltimore was very emotional for him too and is record-breaking for any artists in Baltimore at that time that he took notes on what was on his mind upon receiving the letter from the museum. The Venetian Flight, first prize - ARTISTS USA 1981 in New York was another important milestone in Bert’s art career as he considered New York a very competitive place and regarded it as one of the art capitals of the world aside from Paris. 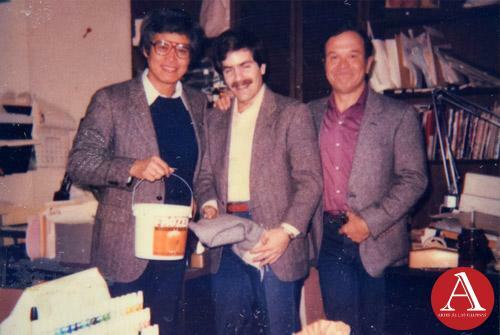 But most of all, to be awarded Most Outstanding Asian American in Art in 1996 in New York was just as meaningful to my father as it capped all of his notable achievements in the past as an artist. Lamberto Hechanova’s works have transcended time, race and boundaries. Let’s go through some of your father’s works. Tell us about his paintings, Algae (1966), Political Epilogue (1967) and Allegory in Aluminum (1968). I can only tell you from the records that these were notable award- winning abstract works in their time. I have also seen some photos of them in news articles. 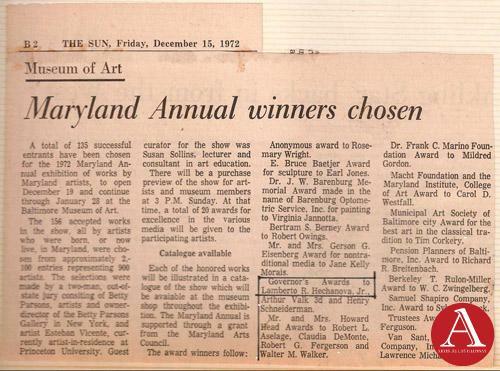 Aberglaube (1971) Aberglaube was my father’s first major award-winning artwork in the US, specifically in Baltimore Museum of Arts (BMA) Annual Arts Competition and Exhibition. What is your favorite work of your father? I have a lot of favorites from my father’s works, but I will have to choose those pieces from his New York series for sentimental reasons. 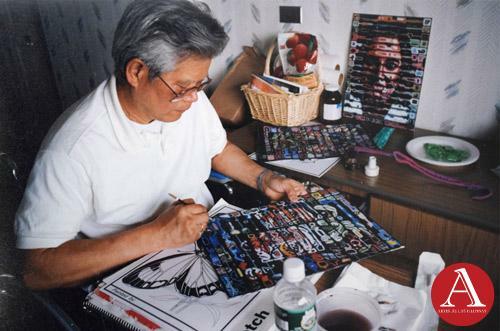 I was there in New York in 1996 while he was still creating them in his studio. He explained to me that this specific style of PlyArt and its process. This series consist of twelve beautiful artworks from my father’s original and award-winning style that he called PlyArt. This style was already evident in his Aberglaube painting that won in 1971. Venetian Flight was also a variation of the PlyArt style that won in New York Art Competition in 1981. In fact, the pieces from New York series was a full-blown variation of PlyArt. 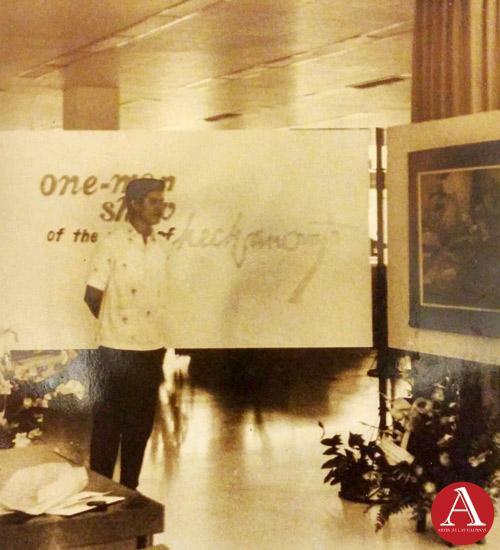 It also convincingly won in the Philippines when Silvana Diaz, owner of Galeria Duemila, submitted just one painting from his “Pieces of New York’ for an art competition at the GSIS sometime in 1997 or 1998. I still kept the signed original sketch studies which he gave me after they were done. Are you the only one in your family who particularize about your father’s body of work? I cannot really speak for any of my brothers, sister, my mother Nelly or Tita Heidi, but because my father walked me through his life and works while he was still alive, I feel that I can expand on any specific topic in his life or his works in both the US and the Philippines. Are you also in-charge of authenticating his works? There are no talks about this between our families on who is in charge of authenticating his works. I believe that I can do it at some point in my life. What are the other series that your father conceived in the US? 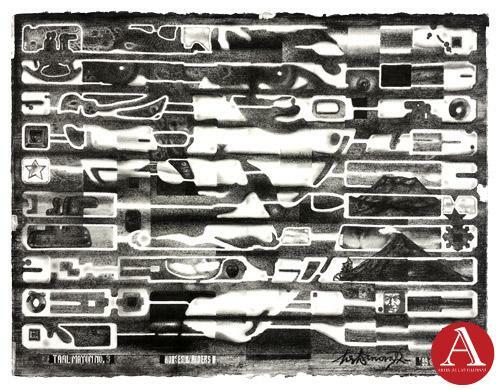 Aside from his award-winning PLYART series, some of the other works that I have seen that he created are Artwords, Arterations, Deconstructions from his works in the 1970s, Sculptural Expressions, Bic Pen Artwork, Off Focus, Calligraphic strokes and many more. Tell us some biographical information about your father. My grandfather’s name is Lamberto Hechanova Sr, once the elementary principal at Kabankalan during his time. My grandmother’s maiden name is Constancia Rallos and she passed away when my father was still at a young age. Bert was the oldest of his siblings, three brothers (Nestor, Buen and Gallo) and one sister (Betty). Not five siblings as indicated earlier in some articles? Was your father the only artist in his family? Not sure if I may have missed other sibling, but I am very familiar with the uncles and aunt that I have mentioned. They were with us at some point in our lives and even up to now, we still have an open communication with them. In some documents it was stated that he was born in Pavia, Iloilo while others stated that it was in Kabankalan, Negros Occidental. Where was your father born? My father was born in Kabankalan, Negros Occidental, although he grew up in both towns of Pavia and Kabankalan. He was with my Lolo Crispin Hechanova and family while he was in Pavia, Iloilo. He attended the Pavia Elementary School, Pavia High School and Kabankalan Elementary School. Tell us about your family. Your Mom who he married, your siblings. My mother’s name is Nelida Carreon and I have an older brother, Bernie. My father re-married in the US to Tita Heidi Mijares. Anthony and Cheryl are my siblings in the US. We all have a very good relationship and respect for one another. Me and my brother, Bernie have a natural talent in art, though we never really think of it as a big deal. Ever since we were young, drawing and sketches were just one of our pastimes. We didn’t grow up with my father’s guidance or influence because he left the Philippines when we were very young. I ended up studying Architecture and have won logo designs and cover design competitions even as a freshman student. In my final 5th year, I was the graphic artist in our university and my cover designs have won in the regional level in Iloilo. I also have a natural interest in paintings and have participated in art group exhibits with my artist friends. However, the fusion of my experience in architecture, art, advertising and design somehow led me to work overseas and settled to where I am currently today which is in Canada, working in high-end motion graphics and design for a television network. What about your brother Bernie? What is his occupation? How much does he know about your father’s body of work? 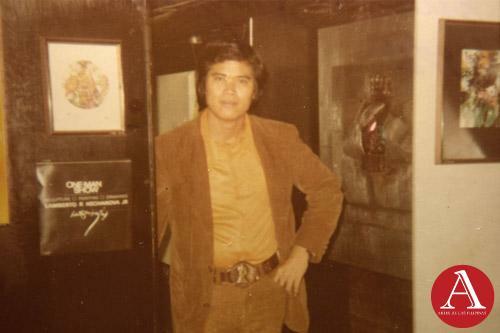 My older brother, Bernie in his early days used to work as a disc jockey at a radio station and hotel club in Iloilo. At some point, he was also with Casino Filipino as a dealer but is now based in Bacolod City. 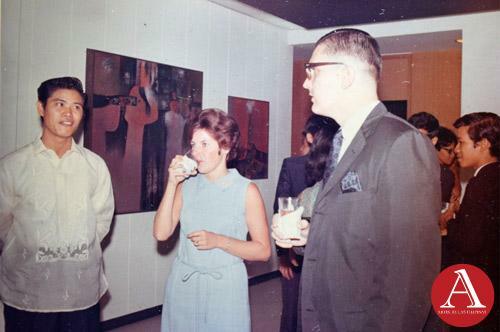 To a certain degree, Bernie also knows some details about my father’s artworks in the Philippines. He personally received the award, in behalf of my father, when the city of Kabankalan honored him with the Outstanding Kabankalan Citizens Award. He also had a chance to talk to the podium about my father and his achievements during the award night. Am I right to assume that the US period of your Dad should be discoursed by his second wife and children for reason that they saw his route in those particular periods? If you based it on the number of years. Yes, of course, since they were together in the US especially from a wife’s point of view or a father relationship level. But as to who can really define Lamberto as an artist, I believe that “seeing” and “understanding” his works or his career as an artist can be two different things and it’s not that easy to discuss. It may also take an artist to really know and understand what an artist’s mind and feelings were especially Bert. Speaking from my own experience with my time spent with him, Bert literally walked me through his life and works and he explained to me in details about all the questions and curiosities I have on the different times of his life from the 1960s to his current works. I probably have asked the most questions about his life and in doing so I felt that I knew my father from a 360 degrees point of view. We also clicked very well as both of us fluently speak in either English, Tagalog or in Ilonggo dialect and so communication is easier. As our father and son relationship grew, his life was an open book to me as he confided things that he cannot really tell anyone else. I also took the initiative to ask my father’s very close friends as to who he really was from their own perspectives. As I looked back, it seems like those times have prepared me for times like these. I have the answers on my chest and I can answer it from the heart. Your Dad had a spinal injury in 1989 brought about by a fall. He was paralyzed from it and underwent years of therapy. Did he recover from it? The spinal injury that he suffered in 1989 was a life- changing incident that paralyzed his lower body. He was on a wheel chair for twenty-five years until he passed away. Doctors and artist friends counted him out and told him that he could not paint anymore yet he proved them wrong. He persevered and his tenacity continued to find innovative ways to create life-size artworks on canvas and created sculptures out of materials that were available to him at that time. For twenty-five years since my father’s accident, Bert found himself in and out of the hospital due to medical complications, though he withstood this setback, weathered and endured the debilitating pain and injury that paralyzed his lower body, and all the inconveniences that came with it. In one of his notes that he put on his painting, he wrote: “No pain, No Gain.” Art was his therapy. Why was he put in a nursing home in 2001? It was probably a very hard decision from Tita Heidi. She decided it for my father’s own good due to him being handicapped and could not take care of himself while Tita Heidi worked in a New York hospital as a nurse. But in my father’s thoughts, heart and mind, he always wanted to be in his home with his artworks and in his very own studio. What amazed me the most was that even with this setback and on a very limited space and art resources in the nursing home, Bert persevered and still won many art awards in competitions while he was on a wheelchair. Did you get to be with him while he was there? I visited him every year in the nursing home whenever I can since I lived in Canada from 2001. I slept and ate there with him for convenience every time I visit. We also have many lengthy phone conversations (US/ Canada) whenever he was lonely and wants to talk about his life in general. 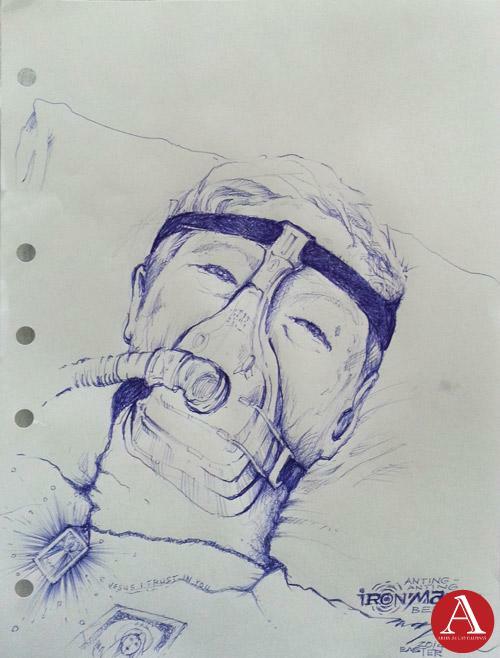 In 2014, I made a sketch of him while looking after him in the hospital. I also gave him a special artwork I did last March 2014, his 75th birthday, while he was admitted in the hospital. I never knew at that time that it will be his last birthday. That artwork pretty much sums up everything in his life. God bless Bert wherever he is now. This interview is especially for him. What did your father die of when he passed away in August 31, 2014? He suffered an infection that got him really sick. He was rushed to the hospital in an emergency ambulance but never recovered. That day, August 31, 2014 was his due time and final destiny to see God face to face and be with him forever. And the cause of his death was? In medical term, it was a cardiac arrest but there were already some internal complications when one takes pain medications over a long period of time. Any infection that was not taken care immediately can be fatal, in case of emergency. The show that was held in New York before he died, was that planned as a farewell show? Tell us about what was put out in this show or if they were borrowed from private collections in the US? The LRH RETROSPECTION was held in 2015 after my father passed away. Together with my daughter, Jacquelyn, we visited New York in autumn of 2014 and approached Mr. Victor Cruz of the Philippine Center New York for a possible retrospective show for my father. They openly accommodated us for the exhibit and scheduled it in 2015. Except for two, all the paintings in there was from our own private collection with classic works dated as far back as 1965, while my father was in Hong Kong for a short stint working for an ad agency. There were also two beautiful paintings from the PCNY Collection that were included in the art exhibit. 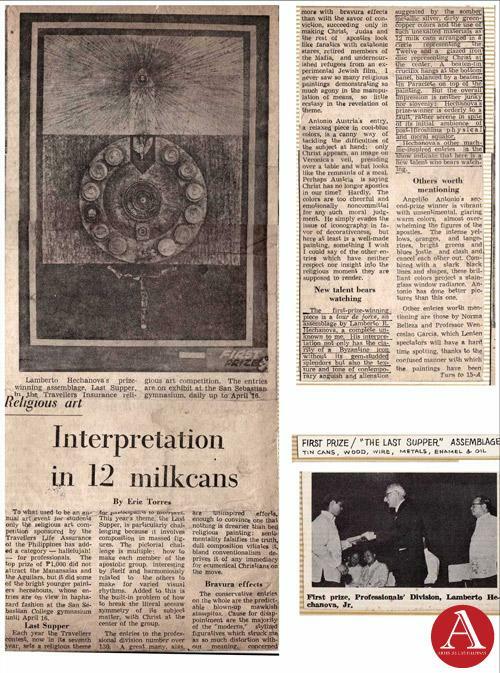 The ‘LRH Retrospection’ art exhibit was the first time that guests have seen classic old newspaper articles of the artist’s success from the 1960s and 1970s. 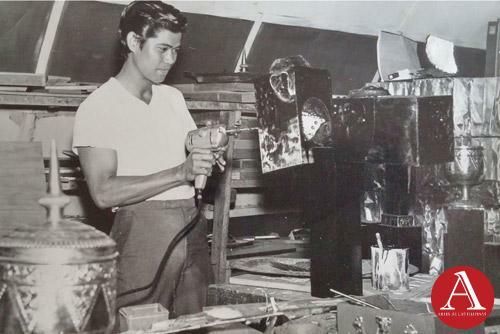 Combined with his artworks in various media and styles, it chronicled the life and works of Lamberto Hechanova during his time as an award- winning Filipino-American artist and sculptor. What was the last work that your father completed? I remembered my last visit with my father in July 2014 when he recovered and got out of the hospital. It was my last summer with him and we did some collaboration artworks involving three generations of the Hechanova family: my father (Bert), me (Martin) and my daughter, Jacquelyn. It was freestyle on a 4’x8’ canvas. We had fun and a great time with him as always. Do you let your children know about their grandfather’s life and art? My three daughters, Justine, Jacquelyn and Mary Joyce, are now grown-ups and they knew their Lolo’s achievements through me and my wife, Jessica. They were also lucky to spend some quality time with their Lolo during our family visits with him. With the availability of the information now in his website, hechanovanyc.com, it is the most accurate reference of my father’s life and works that I have gathered that anyone can learn from it. 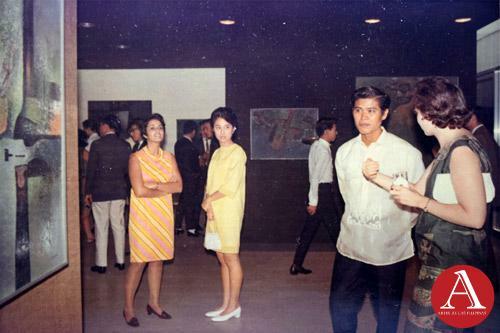 Your father has been away from his home land for decades, do you think that his body of work hold a significant place in the history of Philippine art? 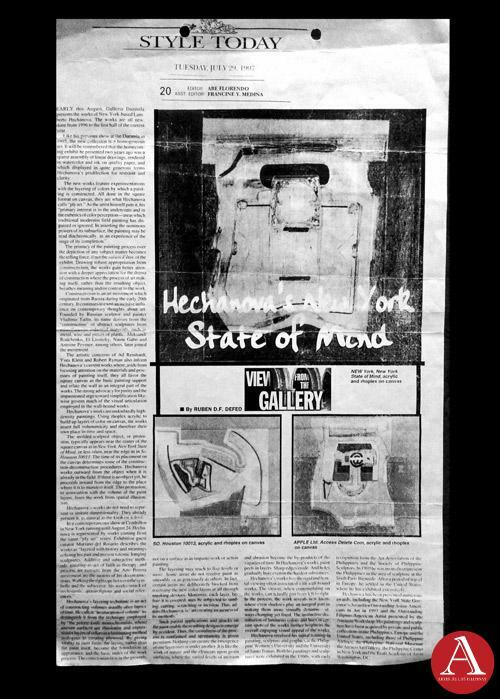 If you talk about the history of Philippine modern art, I believe Lamberto Hechanova holds a significant place there, too. Not just the awards and recognitions that he accumulated in just three years in the Philippines which was overwhelming, but he also inspired and nurtured other young talents. 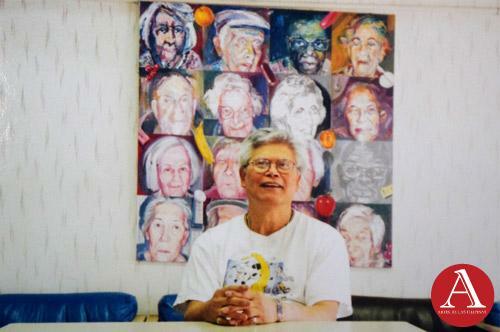 Bert was a mentor in the Fine Arts Department in the Philippine Women’s University and inspired many of his art students, artist friends and even fellow teachers. The numerous reviews and comments from various art writers, media critics, and fellow artists during his time for his works were all understated. 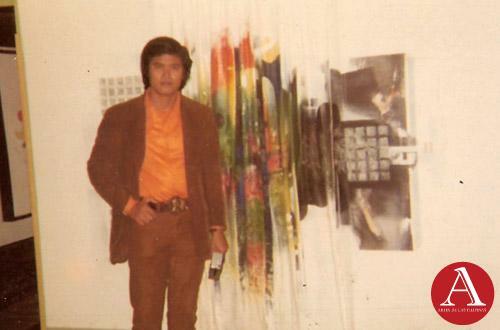 I personally knew my father as an artist by heart that he will never like to stay still in his comfort zone and will explore bigger challenges for his art, and so he left the Philippines in 1969, experienced new horizons in art and went to Paris and other parts of Europe and New York. Having seen the world and with such a high respect for contemporary modern art in New York, he regarded those two cities as the melting pot of art in the world. Bert knew this was his place to die and didn’t want to live anywhere else. 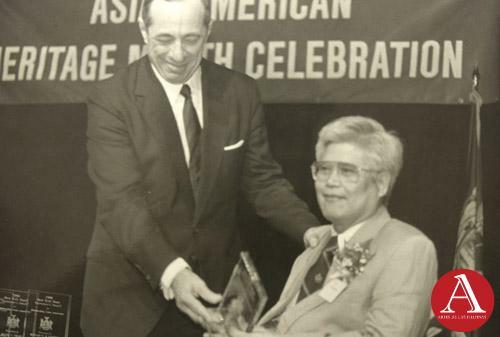 To be awarded “Most Outstanding Asian American in Art’ in 1996 in New York was just a testament and a cap of recognition for an artist like Bert. 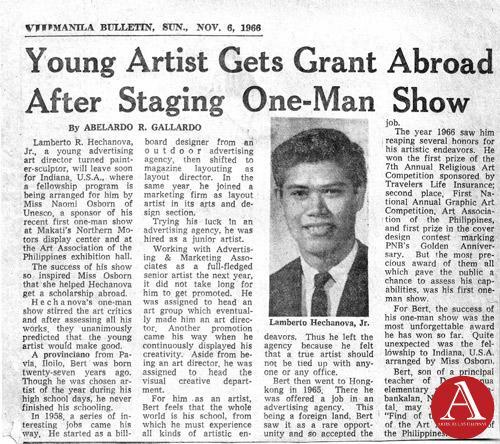 He has somehow transcended boundaries, making his high mark in Art not just in the Philippines but also in the US. What measures do your family take to assure that the legacy that your father has left will continue to be remembered in the generations to come? We have future plans for sure. I also believe everything is in God’s time. Destiny will reveal to us in the near future and it is just a matter of time. My father’s personal website, hechanovanyc.com was my father’s most comprehensive curriculum vitae as far as I’m concerned and I have compiled it to the best of my knowledge and research. The website is also one of our collaborative works which he wanted me to do since years back. He passed away when I finally finished and published it online. If your father continues to work today, how do you think his art would have fared? 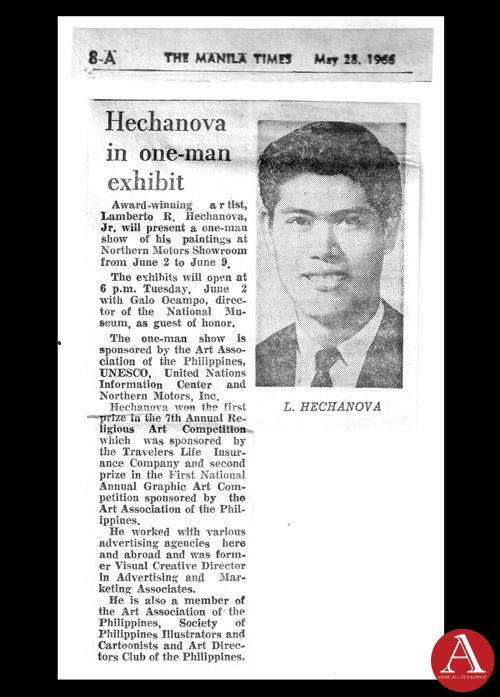 Lamberto Hechanova as an artist/sculptor, despite all his accomplishments and achievements in the Philippines and in the USA, was never worried about how his art would fare. From his own words which he always said to me while in his studio: “If there is just one notable curator who will assess all that I have done in my lifetime, they will see…” and I truly believe that time will come.